Much educational research today is focused on assessing reforms that are intended to create equal opportunity for all students. Many current policies aim at concentrating extra resources on the disadvantaged. The state-of-the-art research in Schools and the Equal Opportunity Problem suggests, however, that even sizeable differential spending on the disadvantaged will not yield an equality of results. 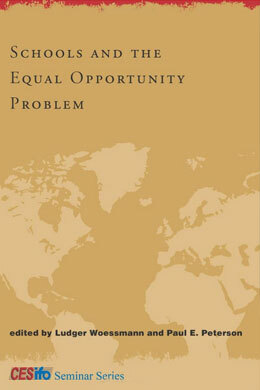 In this CESifo volume, leading scholars from the United States and Europe use the tools of economics to assess the outcome of efforts to solve education's equal opportunity problem in a range of countries, including the United States, Britain, Germany, Sweden, and Italy.The evidence shows some routes for advancement--testing with high performance standards, for example, and well-designed school choice--but also raises considerable doubts about whether many current school policies are effective in dramatically altering the opportunity structure. The evidence presented also calls into question the idea that causal peer effects are very strong. The contributors examine such topics as the link between education and parental income, the problematic past research on peer effects, tracking, the distribution of educational outcomes, human capital policy aimed at disadvantaged students, and private/public school choice.The research suggests that achieving universal primary and secondary education is both urgently needed and feasible. Will the international community commit the necessary economic, human, and political resources? The challenge, say the editors, is "as inspiring and formidable... as any extraterrestrial adventures--and far more likely to enrich and improve life on earth."